The U.S. Department of Commerce estimates that jobs in science, technology, engineering and math will grow 17 percent by 2018 nearly double the growth for non-STEM fields. By 2018, the U.S. will have more than 1.2 million unfilled STEM jobs because there will not be enough qualified workers to fill them. 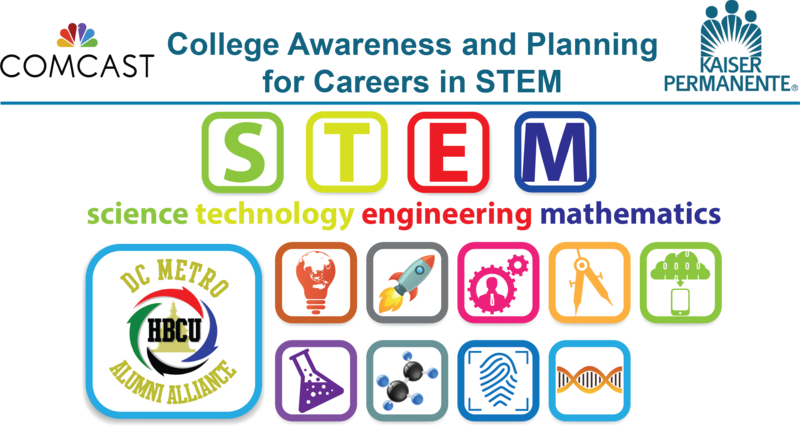 STEM is where careers are today and where the job growth will be in the future (particularly for minorities). HBCUs are playing a critical role today in helping America overcome a looming shortage of scientists and engineers who are vital to the nation's future economic growth and competitiveness. These educational institutions are producing a large share of the nation's African American graduates in the fields of science, technology, engineering and mathematics. The DC Metro HBCU Alumni Alliance and their community partners Comcast and Kaiser Permanente is making future Science, Technology, Engineering and Mathematics (STEM) leaders are reality for children in the Washington, DC Metro area (DMV) including students with a disability. A full-day program is led by HBCU alums who are currently working in STEM related fields providing hands-on experiments to students in grades 9 thru 12.